This data set consists of water chemistry data from streams, wells, rainwater, and canopy throughfall samples. The field measurements were carried out at Rancho Grande in the Brazilian state of Rondonia, in the southwestern Brazilian Amazon basin, at two adjacent watersheds, a forest (1.37 ha), and pasture (0.73 ha). Samples were collected during one entire rainy season starting in August 2004 and ending in April 2005. There is one comma-delimited data file with this data set. Figure 1. Location of the study site: (a) marker shows the location of Rancho Grande cattle ranch in central Rondonia; (b) forest watershed; (c) pasture watershed. Contour intervals are every 0.5 m; elevations are shown relative to the watershed outlets (flumes). From Chaves et al. 2007. This data set was archived in March of 2012. Users who download the data between March 2012 and February 2017 must comply with the LBA Data and Publication Policy. The investigators were Deegan, Linda A.; Ballester, Maria Victoria Ramos; Krusche, Alex V.; Victoria, Reynaldo Luiz; Barthold, Frauke; Bolson, Marcos Alexandre; Bonelle, Nilton; Bonilla, Adriana Lucia Castellanos; Charbel, Luiz Fernando; Chaves, Joaquin Ernesto; Elsenbeer, Helmut; Guandique, Manuel Enrique Gamero; Germer, Sonja; Gessner, Alaide Aparecida Fonseca; Neto, Sergio Candido Gouveia; Grimm, Rosina; Haupert, Christie Lynn; Huamani, Juan Carlos; Johnson, Mark Stephen; Lampert, Samantha Morris; Leite, Nei Kavaguichi; Martinelli, Luiz Antonio; Menuzzo, Rodrigo; Moraes, Jorge Marcos de; Neill, Christopher; Oliveira, Ana Christina Belarmino de; Ometto, Jean Pierre H.B. ; Silva, Ariveltom Cosme; Silva, Jonismar Souza; Sonoda, Kathia; Thomas, Suzanne M.; Victoria, Daniel de Castro and Werther, Lisa. You may contact Neill, Christopher (cneill@mbl.edu). This data set consists of water chemistry data from streams, wells, rainwater, and canopy throughfall samples. The field measurements were carried out at Rancho Grande in the Brazilian state of Rondonia, in the southwestern Brazilian Amazon basin, at two adjacent watersheds, a forest (1.37 ha), and pasture (0.73 ha). Samples were collected during one entire rainy season starting in August 2004 and ending in April 2005. 6 Discharge L/s Discharge in L/s at the time CF samples was collected. Calculated from stage height at a 30.5 cm H-flume at the outlet of each watershed logged every 5 minutes with a TruTrack 50 cm datalogger. Assessment of material fluxes from/to atmosphere, canopy, soil and groundwater to/from streams and watersheds of the elements and chemical species investigated. Error Sources: Possible sample contamination during collection, manipulation and/or analysis. Suspect samples were removed from dataset. Field measurements were carried out at Rancho Grande in the Brazilian state of Rondonia, in the southwestern Brazilian Amazon basin, at two adjacent watersheds, a forest (1.37 ha), and pasture (0.73 ha). Both watersheds were instrumented for hydrological and hydrochemical measurements beginning in August 2004. Mean annual precipitation, based on daily rain totals collected since 1984 by the landowners, is 2,330 mm with a pronounced dry season of <100 mm month-1 from June through August. The forest watershed contains open moist tropical forest with a high density of palms typical of the region. The pasture was cleared in 1985, planted to pasture in 1986 and has had continuous cover of the African forage grass Brachiaria humidicola since that time. It has been actively grazed at about 1 animal ha-1. Both watersheds are drained by channels that convey water in response to some storm events regardless of season, and intermittently towards the end of the rainy season in some years. A tipping bucket rain gauge (Hydrological Services P/L, Liverpool Australia) and a Campbell logger installed in the pasture recorded rainfall intensity. Incident rainfall volumes and rainfall samples for chemical analyses were collected after each precipitation event into a 20 L acid washed polyethylene container using a trough-type collector installed 1 m above ground. Canopy throughfall was collected after each event at 20 similar trough collectors distributed throughout the catchment. Figure 3: Sequential sampler design: Composite of two through collectors, a tipping bucket and 10 sampling bottles. The detail image in the lower right image corner shows individual sampling bottles and the connection tubing. Overland flow samplers were placed at one location in each watershed during the first four months of sampling and at three additional locations in the subsequent months of sampling. Groundwater was sampled weekly from three wells at each watershed. Wells were 5 m apart and 10 m from the outlet of each watershed and ranged 4-6 m in depth. Samples of soil solution from the vadose zone were taken every ten days from tension lysimeters installed at two depths at ten locations in each watershed. The lysimeters were installed above and below the texture break at the top of the B horizon (20, 100cm). 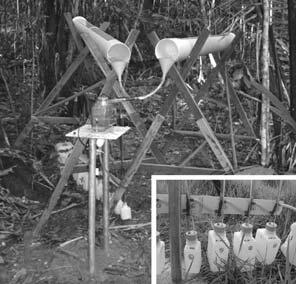 TF (liters) measured at 20 collectors (1-20), installed on support 1 m above ground, made out of 150 mm diameter PVC pipe, which were connected via flexible tubes to 20 L plastic canisters from which sample for hydrochemistry was also collected. The total collecting area per collector was 980 cm2 (70 cm * 140 cm).To avoid splash losses an orifice with a width (70 mm) smaller than the diameter was cut out of the PVC pipes. Throughfall quantities per event were measured manually with 20 collectors. Two hours after every event or alternatively the next morning for events which ended after 09:00 PM, we emptied the collectors and quantified the throughfall with graduated cylinders of three different sizes. For events with less or equal to 5 mm, between 5 and 15 mm and events greater than or equal to 15 mm graduated cylinders of 100 ml, 500 ml and 1000 ml were used, respectively. Stream flow was collected from a 30.5 cm H-flume installed at the outlet of each watershed using ISCO samplers. Samples were collected every five minutes during the first 80 min of flow and every 20 min for the following 160 min. Stage height was recorded every 5 min with TruTrack loggers installed on each flume. All field measurements and sampling were conducted between late August 2004 and late April 2005, excluding December 2004 due to personnel and logistical limitations, and encompassed an entire rainy season. The logging equipment recorded precipitation intensity and stage heights continually for the duration of the study. After collection, all samples were transported to a field laboratory located 500 m from the research watersheds and filtered through Whatman GF/F filters (0.7 um pore size). Samples were preserved with thymol and stored frozen in 60 mL acid-washed polyethylene bottles. Concentrations of cations and anions (Na+, K+, Ca2+, Mg2+, NH4+, NO3-, NO2-, Cl-, and SO42-) were determined by ion chromatography (Dionex DX-500) and silicates (SiOH4) colorimetrically at the Centro de Energia Nuclear na Agricultura, at the University of Sao Paulo, in Piracicaba, SP. Dissolved inorganic carbon (DIC) species were determined at the field laboratory with a LICOR infrared gas analyzer. Alkalinity was determined by titration to a fixed pH (4.2). Conductivity and pH were measured in the field with an Orion pH/conductivity meter. DOC was analyzed on a Shimadzu TOC analyzer. Using an end member mixing analysis approach, we evaluated potential contributing sources of stream flow during that rainy season in the forest and a pasture watersheds (Germer et al., 2006; Chaves et al., 2007). Water yield was 17% of precipitation in the pasture and 0.8% of precipitation in the forest. During the early rainy season, throughfall, groundwater, and soil water contributed 79%, 18%, and 3%, respectively, to total forest stream flow. Over the entire rainy season, throughfall, groundwater, and shallow soil water provided 57%, 24%, and 19%, respectively, of stream flow. In the pasture watershed, overland flow dominated stream flow both in the early (67%) and late (57%) rainy season, with a mean contribution of 60% overland flow, 45% groundwater, and 5% soil water. High concentrations of NO3- in forest soil solution relative to low NO3-concentrations in forest groundwater indicated a large removal of NO3- in flowpaths leading from soil to groundwater. Germer, S., H. Elsenbeer, and J.M. Moraes. 2006. Throughfall and temporal trends of rainfall redistribution in an open tropical rainforest, south-western Amazonia (Rondonia, Brazil). Hydrology and Earth System Sciences 10(3):383-393. Chaves, J.E., C. Neill, S. Germer, S. Neto, A.V. Krusche, and H. Elsenbeer. 2007. Land management impacts on runoff sources in small Amazon watersheds. Hydrological Processes. Neto, Sergio Candido de Gouveia. 2006. Concentracoes e balancos de Carbono organico dissolvido em duas bacias do estado de Rondonia: uma comparacao entre floresta e pastagem. M.S. Thesis. University of Sao Paulo, Brazil. 55p.